Edited to add: Linked to A Soft Place to Land Mantel Linky Party 4/01/10. This is an old post from January when I was craving Spring! I love to decorate my mantel. Even when the rest of my house looks like total crap, if my mantel looks great I feel better about my incompetencies. Sad perhaps, but true. In hopes that I’m not alone on this one, I thought it would be fun to host a weekly “mantelscape” party. Slap some things up on your mantel, take some photos, and let us ooooo and aaaahhh. It is that simple. Each Thursday night, I’ll put up McLinky for your mantel posting pleasure. 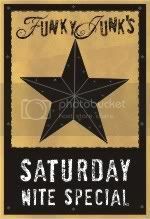 It will stay open until Saturday, so join the party when you feel like it! As always, we do not discriminate against mantels on The Stories of A to Z. Previous posts, other people’s mantels, and shelves made to look like mantels are all welcome! So, do you want to see what I currently have going on with my mantel? Too bad. I’m going to show you anyhow. I have all these fun things kicking around my house from the wedding. See those gorgeous green bottles? I have about 60 of them! If I can figure out how to make that PB chandy with the green bottles, I’ll let you know. Mmmm hmmm. My wheels are turning. Speaking of Pottery Barn, did anyone notice how almost every single trend I outlined in this post here is in the January 2010 catalog? Guess we’ll be seeing more nests, birds, and mercury glass this year! To add some height to the right side of my “scape”, I stuck a dollar store hurricane (left over from the wedding) on top of a candlestick. And I have to admit that I just love the little nests. They’re cute. After taking some pics, I felt my mantelscape could benefit from another layer, so I stuck a mirror behind my birdcage. I love how the mirrors give the illusion of more depth. Love. it. All of the candles look so romantic when lit. They almost make me forget how frigidly awful it is outside right now. Have I told you recently that I hate winter? Like, passionately hate everything about it? Sigh. As I write this, I am sitting by my fireplace looking up at all that glorious green and the promise of spring….and I feel hopeful. Yep. Hope….in a mantelscape. This is one of the reasons I love to decorate. Okay, now it is your turn! Show me what you’ve got going on girlfriends (boyfriends? ), friends! I am excited to see. I am here via Kimba's Soft Place to Land. Your Mantel? Ohhh. Ahhh. It's gorgeous! The green contrast is stunning! That bird cage is DI-VINE! I LOVE it! I am on the look out for one that costs less than $20. Yeah I know, wish me luck. I might as well be looking for a leprechaun. 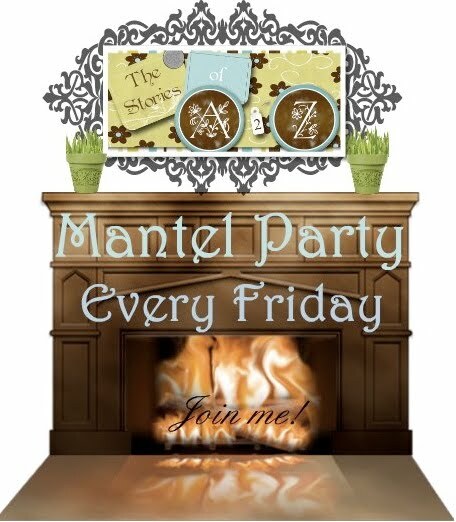 What a cool idea – a mantle party! Too late for this one, but will be back for the next one. The mantle is always the one thing in my kitchen and drawing room that I carefully decorate… And there is so much inspiration here. Cool! Cool party! I'll have to join next week! Your mantel is wonderful, Beth! The combination of the wood with the green, black and white.. wow. Just beautiful! oK! i love your mantle party and I am featuring it at somedaycrafts.blogspot.com. Hopefully this will help your blog have more partiers next week!!! Grab mY "featured" button. Love your mantle, and I would love to participate, but once I take this Christmas stuff down (do you hear me?? I actually still have STOCKINGS hanging!!!! ), it will probably stay the same most of the year. Sorry I've been a bad friend and not returned the email!! My grandmother just left thursday and it has been quite an eventful visit. Just know that I didn't forget about you! Love this mantle……Great ideas….so glad that you are doing this…. What a fun party! Your mantle is beautiful! it is a total coincidence that i have just changed my mantel and blogged about it and THEN found your party! the hearth is indeed the Heart of the home! Gorgeous!! I thought of you and had to laugh – the other day my mom was talking about how cool her bird nest collection looks under glass. Let the imprisonment of innocent items continue! Oh, how happy I am to have found you (via Cindy at Cottage Instincts) I love a pretty home but I am decorating challenged. My mantle is currently empty and I have been searching high and low for ideas. Thanks for all the lovely inspiration! Whoody whoo! What a great linky party. I'm working on getting my den in order. We have a fireplace in there so I'm anxious to make some mantlescapes. I'll try and participate next week. In the meanwhile, I'm going to go check out the others linkers for inspiration! But first I'm off to look at what you did for the wedding! GREAT idea Beth! I'll have to take photos and link up next week. I didn't know about this until I just saw it at Manuela's blog. What a wonderful idea Beth and thank you for sharing your mantle it is gorgeous! I have linked up and look forward to this!!! I don't have a mantel – just a huge hole that is my nemesis! Can't wait to see all the inspiration! Jen (Tatertots & Jello) left me a comment saying your were having a mantel party so I came right over and linked up! Thanks for hosting a fun party. Your mantel is just gorgeous! I love the pop of those green bottles. Beth, this is so pretty! I LOVE the green and am nuts for nests! I will try and link up next week, though since Christmas I have been moving and retweaking my mantle. It is a VERY looooooong mantle!! I can't link up because my mantel is not fully adorned, but I love yours. Will you come to my house and decorate mine for me just once? That's all I need! I have a naked mantel right now :O but what a fun idea!! Very pretty! I just decorated mine for Valentine's day! Hi Beth, Your mantel is beautiful! I love pillar candles and your candle sticks are so nice and the mirror to reflect it all. I would leave it just like that all winter. Stunning. Sca-weeee!!!! I just went and made a post so I could play. I LOVE mantlescapes, and I'm always looking for more inspiration. Thanks for hosting Beth! I don't have a mantle, but I have a shelf and my little white cabinet and I vignette on those to my little hearts content. So count me in for one or more Fridays. What a great party idea. I just decorated my mantel for winter a few days ago, so the timing is perfect. 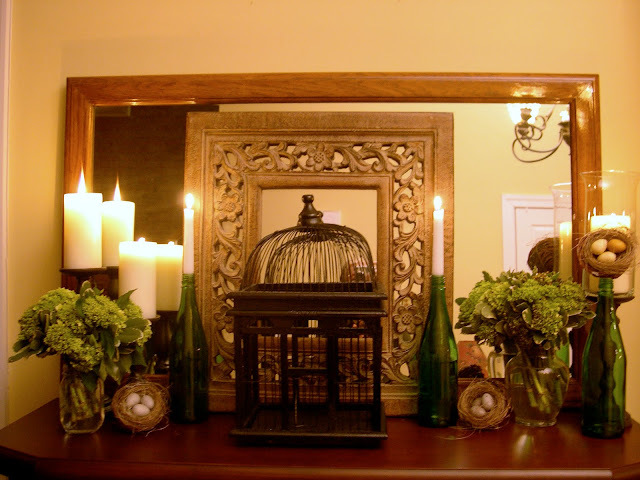 The mirror added behind the birdcage looks great and I love all the layering. I can't wait to see everyone's mantels. I love changing mine often too. What a great idea. I have two of those ugly man-cave tv hole mantels at my house, and I only wish I had one similar to yours. You must have read my mind, because I was scouring blogs trying to find mantle ideas yet didn't know how to search for such things!!! WOOOHOOO, just what I needed!!! So Thank you!! What a fun idea! Can I link up my mantle post from yesterday? I will be back to check these out! Thank you for starting this. When I get more confidence I will be posting some of my own. No mantels required! Shelves on walls, tops of pianos, windowsills, whatever will work is just perfect. Remember, we don't discriminate over here :). I love your mantel and I'll be back to look at others. I am sick of my mantel right now and would love to see some fresh ideas! What a good idea for a party! I was so hoping for something like this, Beth. I am totally inept when it comes to my mantel. Can't wait to get ideas. Do you have a button yet?? I will have to buy a mantle to participate in this:) Actually, I have been desiring one for sometime now. I'll have to cyberstalk Home Depot for a while.